Leave more distance than usual between your vehicle and the one just ahead of you, giving yourself at least 10 seconds to come to a complete stop. Cars and motorcycles usually need at least 3 seconds to halt completely when traveling on dry pavement. Be careful when driving over bridges, as well as roadways rarely exposed to sunlight-they are often icy when other areas are not. Be sure to keep your gas tank full. Stormy weather or traffic delays may force you to change routes or turn back. 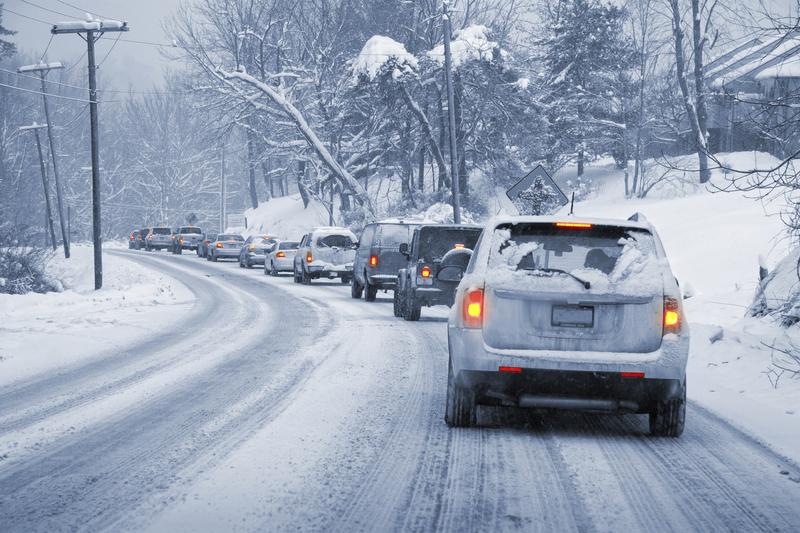 A fuller gas tank also averts the potential freezing of your car's gas-line. Keep windshield and windows clear. Drivers in cold-weather states should have a snow brush or scraper in their vehicle at all times. Your car's defroster can be supplemented by wiping the windows with a clean cloth to improve visibility. Check your exhaust pipe to make sure it is clear. A blocked pipe could cause a leakage of carbon monoxide gas into your car when the vehicle's engine is running.